You can save $15 or more by joining CLA before registering for the event! Join CLA and USC Law professor Jack Lerner in a seminar that explores the fair use of artistic works in film. Fair use is the right to use a copyrighted work without permission or payment, when it is used for certain socially valuable purposes like criticism and commentary. Although filmmakers license most music, film clips, or art for use in their projects, they can make fair use more often that they would know. In this workshop, we will dive into the practical applications of fair use, the DMCA exemptions that allow documentary filmmakers to obtain footage from DVDs and online media, and go through the tests used in making a fair use evaluation. Professor Lerner will also examine court cases in which "fair use" was an issue, and how fair use has become more reliable and predictable over time. Particularly, we'll look at the critical importance of fair use in documentary filmmaking. This seminar is at an advanced level. Filmmakers, film students, and producers with a basic understanding of copyright law are welcome to attend. Attorneys and law students will find it especially useful. This event is co-sponsored by the USC Intellectual Property and Technology Law Clinic. To learn more about the clinic, visit http://iptlc.usc.edu. Jack Lerner, Esq., is Clinical Associate Professor of Law and Director of the USC Intellectual Property and Technology Law Clinic. Professor Lerner received a B.A., with distinction, in English from the University of Kansas and a J.D. from Harvard Law School. He clerked for Judge Fred I. Parker on the U.S. Court of Appeals for the Second Circuit and Judge G. Thomas Van Bebber in the U.S. District Court for the District of Kansas. He practiced intellectual property law with the Palo Alto, Calif., firm Wilson Sonsini Goodrich & Rosati, P.C. and in 2004 was a research fellow with the Berkman Center for Internet & Society at Harvard Law School. Before joining USC, Professor Lerner was Clinic Fellow at the Samuelson Law, Technology, and Public Policy Clinic at the University of California, Berkeley, School of Law. Professor Lerner leads law students in the USC Intellectual Property and Technology Law Clinic as they counsel and represent policymakers, artists, innovators, nonprofit organizations, and others on a range of IP and technology issues. Among other things, under Professor Lerner’s supervision Clinical Interns have successfully sought two exemptions to the Digital Millennium Copyright Act on behalf of a wide coalition of documentary filmmakers that have helped countless filmmakers nationwide to exercise their fair use rights. The USC Intellectual Property and Technology Law Clinic regularly counsels and represents filmmakers, authors, and other institutions such as museums seeking to make fair use, and it has intervened on behalf of documentary filmmakers in numerous amicus briefs and comments in regulatory proceedings. Professor Lerner also served on the Legal Advisory Board for two landmark codes of best practices in fair use: the Code of Best Practices in Fair Use for Scholarly Research in Communication and the Set of Principles in Fair Use for Journalism. 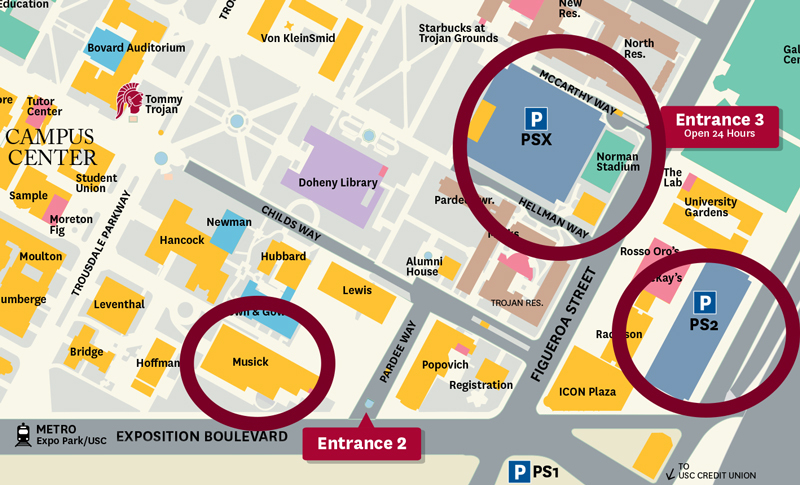 Parking will available at the USC campus for $10 and there are street parking options available nearby. The most accessible parking structure for the law school is Parking Structure X at (620 West McCarthy Way). Guests may also park at Parking Structure Two at the intersection of W Exposition Blvd. and S. Flower Street (3335 S. Flower St). From PSX, head southwest to the corner of Pardee Way and Exposition Boulevard to enter the Musick Law building. From PS2, head directly west on Exposition Blvd. for the law school.